As my little guy approached the world of solids, off I took myself and our little family to wonderful Ballymaloe for this afternoon demo at the start of the month. The minute you drive through the gates of the world famous cookery school you feel energised and positive. We were welcomed by a wonderful array of cakes and some freshly brewed tea and coffee. We were given our packs filled with recipes for the day, then babies were dispatched to daddies and out to the gardens we went. It began with a good discussion on planting your own seeds and how kids are fascinated by seeing things grow and then eating them. Not an easy task to look after little seedlings as well as your little one but their direction and description made me think I might give it a shot! It was then back into the demo room for a discussion on weaning and some valid points from Darina which comes from her self penned notes from both her own daughters/daughters in law experiences. The main ethos is natural, seasonal, organic produce for both you and baby which makes complete sense in your head and by the end of the session it also seems to make sense on your pocket. The main organic buys should be chicken, eggs, mushrooms and oranges according to Darina and outside of this seasonal & local as much as possible. She recommends waiting until 6 months to wean breastfed babies, I have just started Josh at 19 weeks which will be discussed in a separate post and we also discussed baby led weaning versus traditional weaning methods. Most of the recipes are for slightly older babies/children but will be great to have them to hand over the coming months. 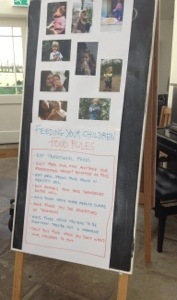 A lot of the recipes where demonstrated and Josh even nipped in for a feed after walking around the beautiful Ballymaloe gardens with his daddy. Samples were passed around and then at the end a spread of some of the recipes was laid out for all the mums and dads to enjoy.